Nigerians will on February 16 choose between two septuagenarians to lead Africa’s largest democracy: President Muhammadu Buhari and former vice president Atiku Abubakar. The pair have run for president nine times between them. There are more than 60 other candidates, though their chances of winning are slim as the wealth and patronage networks of the main parties drive the politics of Africa’s top oil producer and most populous country. Government says it is making progress but the military’s efforts to fight the Boko Haram Islamist insurgency and its Islamic State-allied offshoot, now in its tenth year, are crumbling. The economy entered and climbed out of recession under Buhari, yet the average Nigerian is getting poorer; and opponents say his government is failing to tackle corruption, targeting only the president’s enemies and ignoring allegations against his allies. Amnesty International and Human Rights Watch say the army is responsible for human rights abuses, including the massacre of protesters. The army said its use of force is justified. After spending five months in Britain in 2017 receiving treatment for an undisclosed ailment, opposition groups and other critics said Buhari was unfit for office and his administration was beset by inertia. The president said he is strong enough to serve. The president said he would continue to develop the rail and road network if re-elected. He vows to expand a nationwide vocational skills programme, improve access to credit for entrepreneurs and continue his fight against corruption. Atiku, the candidate of the main opposition People’s Democratic Party (PDP), has been caught up in corruption allegations since serving as vice president between 1999 and 2007. He has repeatedly denied any wrongdoing. His businesses include a port logistics firm and a private university. He promised business-friendly policies to double the size of the economy to $900 billion by 2025 if elected. Atiku’s opponents say he would exploit pro-business policies to enrich himself and those around him. Nigeria is deeply divided. The north is mainly Muslim and the south largely Christian with the population fairly evenly split between religions. There are more than 200 ethnic groups. The three largest are the Hausa in the north, Yoruba in the south-west and Igbo in the south-east. The divisions have led to an unofficial power sharing agreement among Nigeria’s political elite. The presidency is supposed to alternate between the north and south after every two four year terms. As it is not the turn of a southerner and both Atiku and Buhari are Muslims from the Fulani ethnic group – one of the largest in the north – the chance of election violence around ethnicity, religion and region is reduced. The south has favoured the PDP in the past, while the north is Buhari’s stronghold. Buhari (76) is the oldest person to lead Nigeria since the transition to civilian government in 1999 and the PDP chose 72-year-old Atiku as their candidate. Both men say they are energetic enough to take on the top job. Buhari is a retired general who was head of state from 1983-1985. Other military era chiefs continue to wield political leverage, including Olusegun Obasanjo, who led the country in the 1970s and was president from 1999-2007, and Ibrahim Babangida, who ruled from 1985-1993. Both back Atiku. The two main parties, the ruling APC and opposition PDP, do not have clear ideological differences. Competition for control of national oil revenues by elites, patronage and complex rivalries between ethnic groups have play a bigger role in elections than ideology. 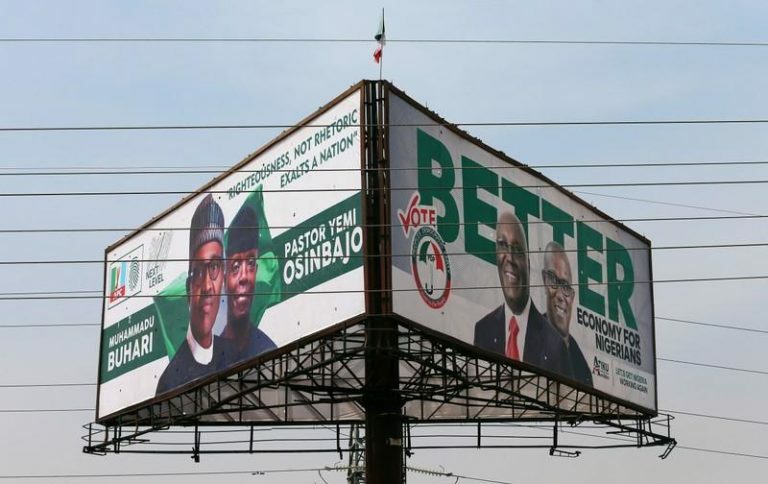 Buhari’s 2019 campaign prioritised poverty alleviation and social schemes, while Atiku stressed the need for a better business environment. Both vow to improve decrepit infrastructure. Buhari won in 2015 after assembling a broad coalition across the north and south-west under the APC party, a version of other vehicles he used to run in 2003, 2007 and 2011.
International observers and civil society groups fear election interference and rigging. They express concern about the way some state level votes were conducted last year and called for free and fair elections to take place. The 2015 contest is the only time Nigeria has had a handover of power from a defeated incumbent since civilian government took over in 1999. Even then, independent observers saw evidence of vote buying, voter intimidation and other corruption. Last month, Buhari triggered a constitutional row when he suspended the chief judge, who has a crucial say in resolving election result disputes, over an alleged violation of wealth declaration rules. The judge has not responded to the charges and his lawyers say the tribunal investigating the allegations does not have the authority to try him. The European Union, United States and Britain said they were concerned about the move. Nigeria said foreign governments should “tread with caution” and their interference was “insulting”. The elections feature in discussions and on news feeds in social media. The government launched a campaign against “fake news”. Facebook said it would roll out some political advertising rules and tools for curbing election interference to Nigeria. The National Security Adviser’s office released a statement saying the internet would not be shut down during the vote. Voter turnout in the 2015 election was 29.4 million, or 44% of 67.4 million registered voters, according to Independent National Electoral Commission data. For 2019, the number of registered voters has risen to 84 million, with just over half of them aged 18-35.